Charlie Carrel first popped up on the Bluff Europe radar after winning the GUKPT Grand Final in December. 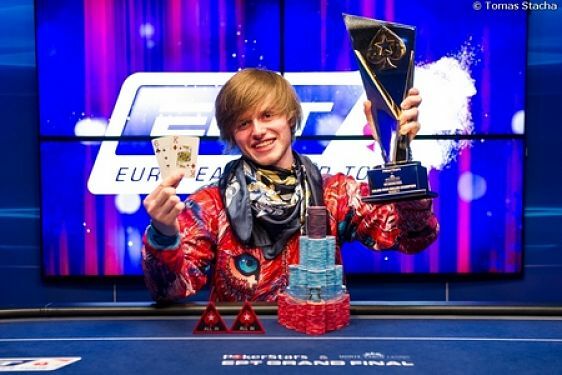 It's fair to say that the 21-year-old is going to get a lot more attention around the poker world after taking down the EPT Grand Final High Roller. The former Warwick University student topped a record-breaking field of 215 entrants in the €25,000 buy-in event in Monte Carlo and pocketed a seven-figure score in the process. The colourfully attired Carrel eliminated no fewer than five of his seven final table opponents including Dan Smith and Steve O'Dwyer before seeing off Senegal's Imad Derwache heads up. Carrel wasn't the only person celebrating on the Riviera. The champagne corks were popping for a number of backers too. He told the PokerStars blog, “This is the first event that I've properly sold action in and I am extremely excited to give a chunk of this away to my friends and that's what makes me feel happiest from this. I get to prove to them that I was a good investment and give them back what they invested in me and more." Charlie Carrel is certainly a name to keep an eye on at this year's World Series of Poker. Image courtesy of Tomas Stacha at PokerStars.